There’s a quotation I can’t quite remember, something about a bear riding a bicycle, that the impressive thing is not how well he rides, but rather that he rides at all. That’s my motto for appreciating the garden today. Nothing looks especially prime, but there are a surprising number of things in bloom, more than I thought before I started prowling with a camera and started compiling a list. The recent storm knocked the last of the curls off the woolly blue curls. It’s my favorite of the plants blooming in the garden this month. 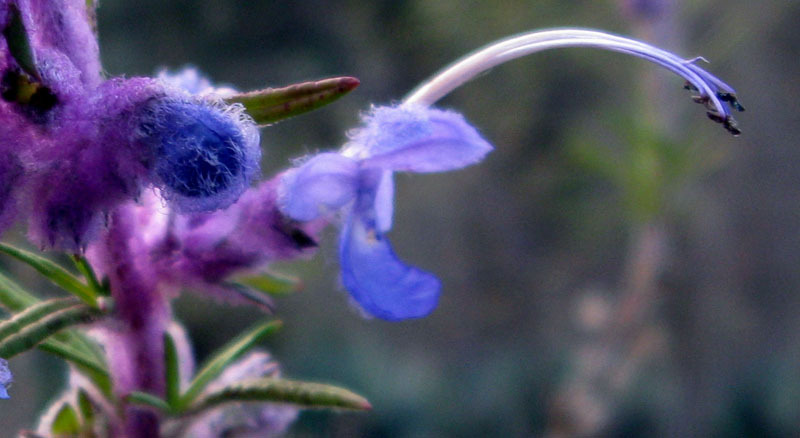 I should probably give more respect to the rosemary plants, which pretty closely resemble the woolly blue curls, but it’s harder to get excited over them, even though the creeping rosemary is in full bloom and is probably the best habitat plant in the garden right now. I probably judge it by the company it keeps. 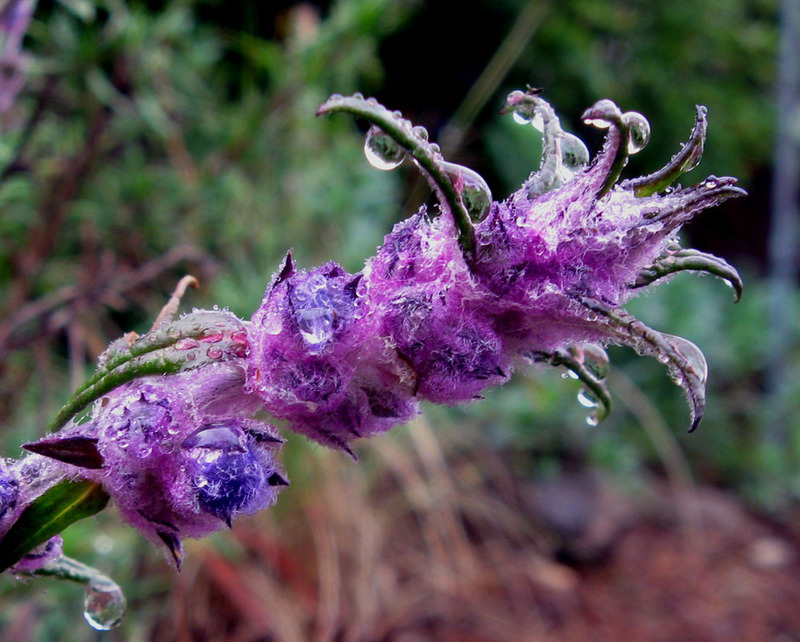 I’ve noticed that most California garden bloggers seem to have at least one species of salvia blooming for this month’s bloom day. 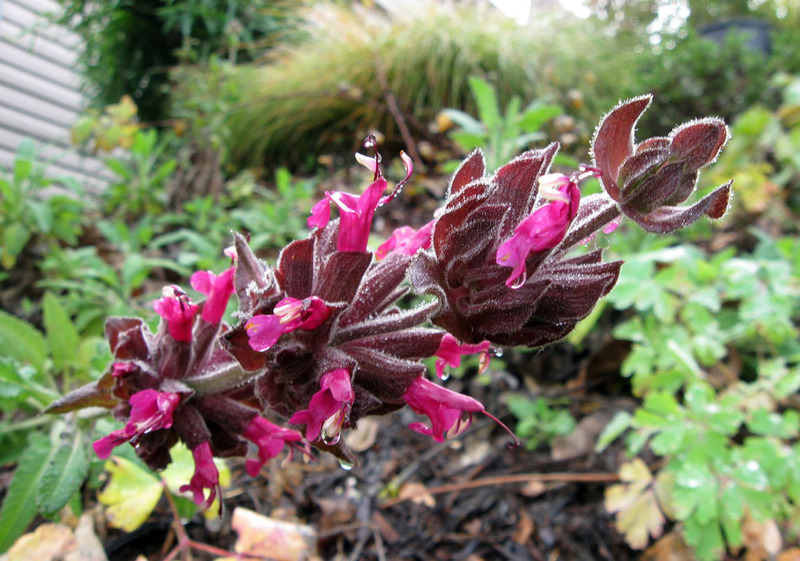 We have Salvia spathacea, hummingbird sage, bearing a single bloom stalk which fell over during the last storm. So far I’ve never had more than one bloom at a time from these guys, but I’m not complaining about anything that blooms in December; our other salvias — S. chamedryoides, S. mellifera, S. mellifera ‘Green Carpet,’ and ‘Hot Lips’ — don’t have flowers right now. The list of everything in bloom is below. Today being in December, I’m not fussy about the quality or quantity. If the plant has a flower, it makes it onto the list. I’m a day late for bloom day this year, but last year I was a week late and didn’t even know I was participating. Unaware of the existence of bloom day last year, on the winter solstice I made a list of everything with a flower (most of the differences between the two lists are due to additions or subtractions from the garden, rather than individual plants blooming or not blooming). I guess I was starting to realize the possibility of something like bloom day, but I sure didn’t have Carol’s vision. Many thanks to her for creating bloom day. Click over to MayDreamsGardens for links to see what other bloggers have blooming. 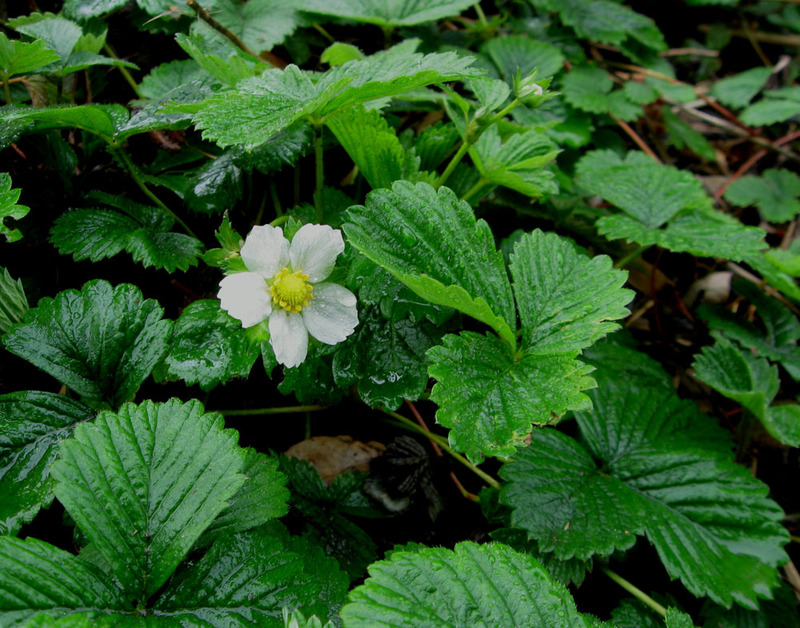 This entry was posted on Wednesday, December 16th, 2009 at 5:05 pm and is filed under garden bloom day, plants. You can follow any responses to this entry through the RSS 2.0 feed. You can leave a response, or trackback from your own site. Every day is Bloom Day. Nice presentation. My rosemary chooses not to bloom, but it is fragrant when I brush against it, so it is forgiven. I don’t know about your climate, but we have to have wet and warm, or cold and dry, alternating. Poor plants hardly know what to do. 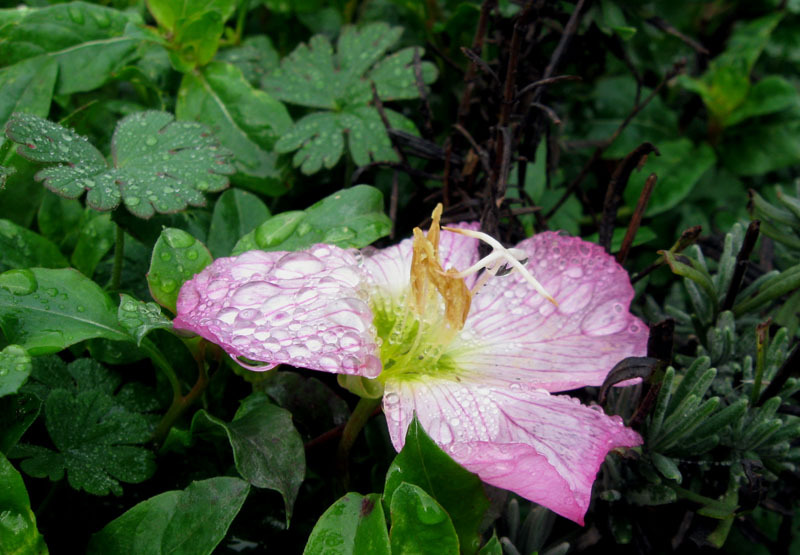 Happy late bloom day….everything looks pretty even with drops of rain on it. Maybe I should say especially with drops of rain. Thankful for any rain, so even if it knocks some curls off there will be more to come! I’m glad I checked back to May Dreams – Your first picture is just lovely – the type of thing to submit to that photo competition over on GGW. I went out the day after bloom day and took more pictures – we also have the underappreciated rosemary you show and the bees just adore it. Our salvia spathacea is blooming now too , just a few spikes – and in one area it is really spreading like I want it to – unfortunately in the area I really want it to spread, it isn’t. Spreading in an area that is shadier – total shade in the afternoon, wetter – entrance bed that gets more water – and better soil – had to import soil because that area was basically builder’s rubble and compacted subsoil. So I’m betting that tihs salvia would do well for me on our north facing slopes where there is a lot of humus from leaf litter – not as a dry shade plant for south facing slopes under oaks, where I was hoping it would take! One day I’ll try woolly blue curls! TM – Happy bloom day back. I am very much looking forward to the days getting longer. 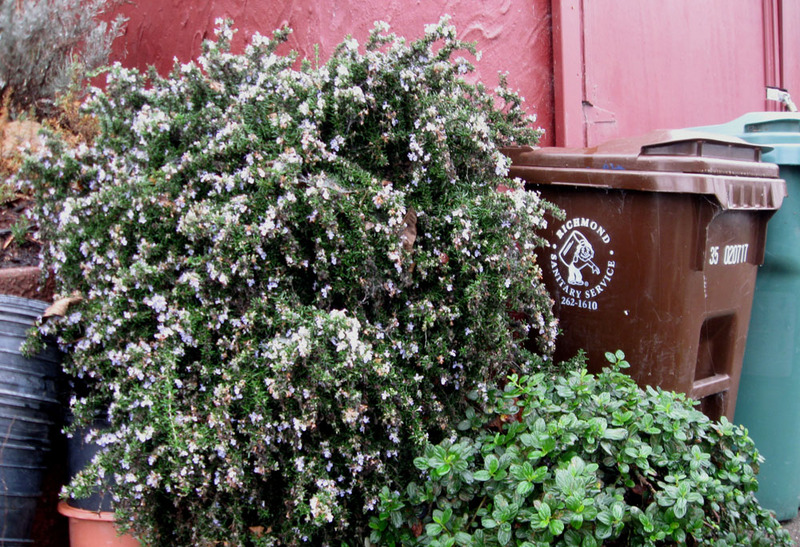 NJ – I figure it can’t hurt to have a fragrant plant next to the the trash cans. 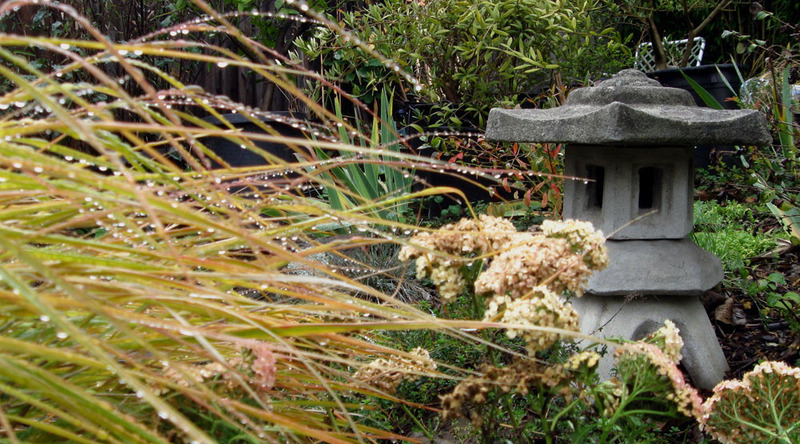 We’re coastal, so most plants can handle our comparatively mild temperature swings. S – You’re right. Sometimes I’m not as appreciative of the flowers when conditions are wet, but the camera sure likes them. CM – Thanks. Our spathacea is on the east side of a slope underneath a walnut and it gets some supplemental water. We’ve grown them in couple of other gardens. They seem to look best with loose soil, part shade, and a bit of summer water, but we haven’t yet ever had them look great, so I’m still trying to figure the plant out. They don’t seem to like hot inland sun, so maybe they get too much direct sun in the summer at your place under the oaks. But, still a plant I’m trying to figure out.